Hotel King’s Town faces the north exit of Kaohsiung railway station where the railway and MRT merge. Tourists can easily go everywhere for business or sightseeing. If you want to explore the city and surroundings, the MRT is easily reached from the hotel. If you don’t know where you want to go, the staff would be happy to provide information about this vibrant, seaside city. 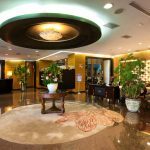 Hotel King’s Town’s staff are proficient in English and Japanese and able to provide satisfaction-oriented quality services that meet your needs in all aspects. With detailed travel information and advice, you will not miss those delicious snacks or fun attractions. Hotel King’s Town offers the best environment for tourists and businesspersons. We invite you to experience this home away from home.